Draft lottery reform has arrived, though it's not as drastic as some clubs would like. 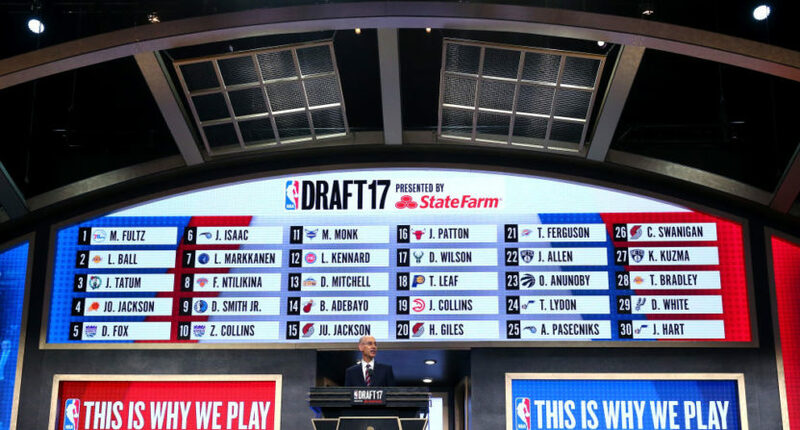 As more and more NBA teams have tanked seasons in an attempt to pick higher in the NBA Draft, the league has attempted to rein in their efforts and reform the draft lottery. A major step towards controlling tanking was taken by the league on Wednesday, but it won’t come into effect until 2019. According to ESPN, the changes were voted on and passed this week. Starting with the 2019 Draft, the teams with the three worst records in the NBA regular season will all have an equal chance at the #1 pick. In the past, the worst record has had a 25% chance, followed by 19.9% for the second worst record and 15.6% for the third worst. But in 2019 and beyond, the three worst records will all have a 14% chance of getting the #1 pick. This could have big implications going forward, because instead of intentionally losing down the stretch to separate you from the other bad teams in the league, organizations won’t be able to gain an advantage by finishing a game or two worse than the second-worst team in the league. But the draft reform doesn’t stop there. ESPN also adds that instead of three teams being part of the lottery draw, there will be four teams in the draw. In the past, the worst team could only fall as low as the #4 overall pick. From 2019 onward, the worst team can fall as far as #5, while the second-worst team can plummet to #6. While these changes aren’t as drastic as, for example, making it possible for the worst record to fall out of the top 10, the changes could deter teams from trying to tank as hard as possible. If a team has clinched one of the three worst records in the league with a handful of games remaining, maybe they will try to play spoiler for other teams down the stretch going forward. In the past, teams in contention for the worst record would try to lose to increase their chances at the worst record to secure the best odds at #1. Another significant change voted on this week regards resting players. In recent seasons, teams have rested players down the stretch in order to make sure they are healthy and ready for the playoffs. This has led to teams like the Cleveland Cavaliers or Golden State Warriors playing nationally televised games without stars like LeBron James or Steph Curry in the lineup. A perfect example of this occurred on March 18th, 2017 when the Cavaliers hit the road to face the Los Angeles Clippers on ABC. The Cavs lost that game by 30 points with James, Kyrie Irving, and Kyle Korver all out of the lineup. Those are the types of situations Commissioner Adam Silver hopes to avoid going forward. The new rules state Silver has the power to fine teams for sitting healthy players during any game. However, the commissioner won’t be able to simply do this whenever he wants. Instead, he can only do so in certain situations. In the new resting legislation, Silver will have the discretionary ability to fine teams for resting players in several instances, including sitting multiple players outside of unusual circumstances in a single game, and healthy players in nationally televised ESPN, ABC and TNT games. The NBA hopes this will push teams to rest players during games that aren’t nationally televised and during home games instead of on the road. On top of that, the NBA is encouraging teams who rest star players during games to have those players on the bench throughout the game so they can both be seen by fans and interact with said fans. In the past, if a team was going on a one-game road trip, sometimes the star players who would be rested wouldn’t even travel.